‘Nigerian Seasonal Produce’ is a monthly column published on the last Saturday of each month. In this column, a writer explores a specific seasonal fruit, vegetable or leafy green assigned by the editors of Kitchen Butterfly and based on the Nigerian Seasonal Produce Calendar. Our author this month is Timi – writer at Livelytwist.com and friend. We’ve known each other since way back in Holland. She writes beautifully, with humour and a lot of empathy. Did I also say my son shares a birthday with her? To write this piece, I summon up my memories about corn. The first one is from secondary school, SS1 or the fourth form. I am fourteen-ish and have to study sixteen subjects or maybe it is eleven, and agricultural science is one of them. As part of our practicals, we are required to grow corn. The plant bed where I plant my corn seeds is a disgrace lying next to Veronica’s bed, which is a rectangular work of art; heaped soil, rising proud, and waiting to be mulched. By contrast, mine is an unsteady triangular arch, not much off the ground, the only effort my blistered palms can muster using a hoe. The corn that eventually grows on my bed reminds me of Pharaoh’s dream—withered stalks and lean and shrivelled heads of grain. I am aware that I will have to work twice as hard in the classroom to get a decent cumulative grade in agricultural science. I do not care much for corn. Maybe this is the root. A friend and I walk over to a woman roasting corn by the roadside. She is fanning coals. My friend examines the ears of corn standing on the iron grill. “Aren’t you worried about dirt, I mean dust?” I begin. “How do you manage to think about such things?” She is shaking her head, not wanting an answer. “Burnt,” she remarks, gesturing. Black overtakes yellow where the corn suffered bruises for the corn seller’s inattentiveness, and rusty brown marks the singed spots. 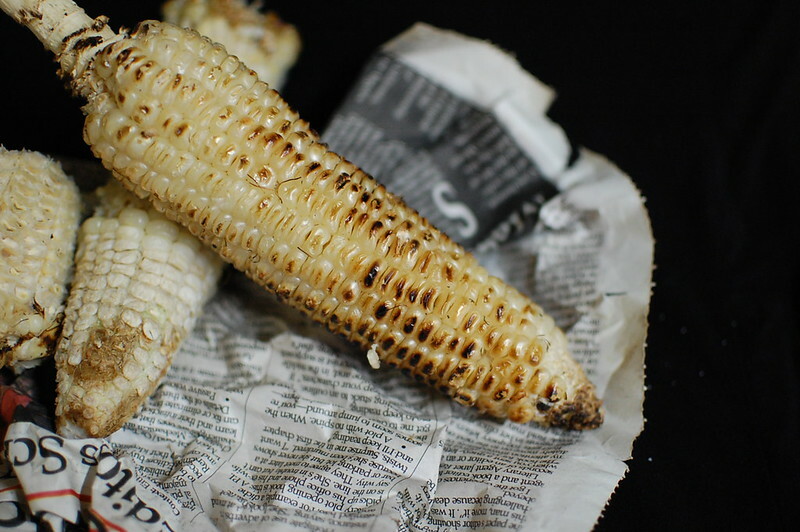 “What of these?” I point to a few roasted corn lying on a newspaper – yellow against black and white. “Cold. It’s better hot. I really want to eat corn,” she gripes, as we walk away. I nod, indifferent. 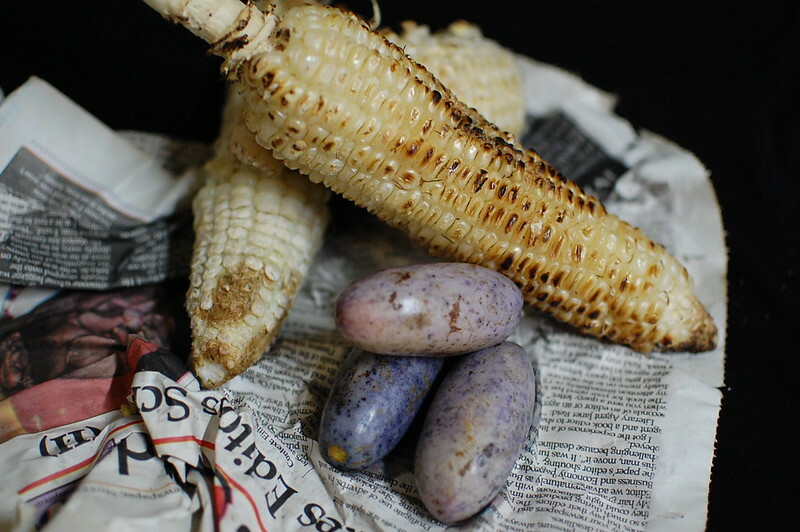 I would have eaten the ube if she bought the corn. But I like popcorn. 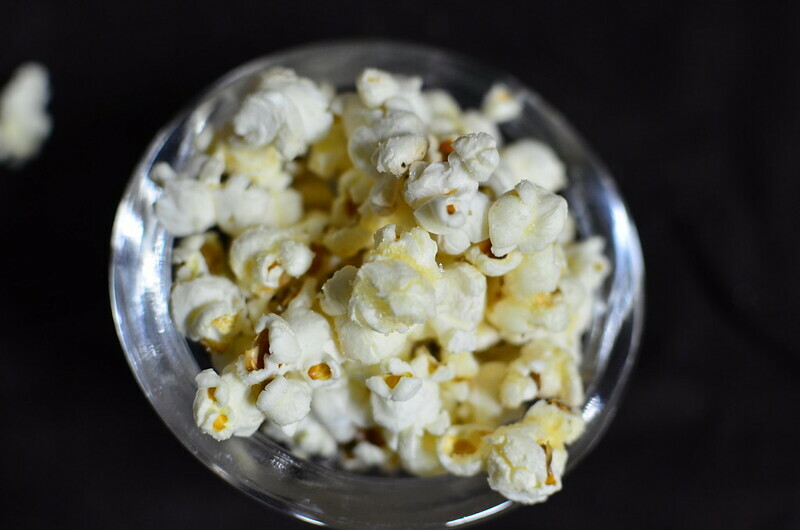 It is a sin to watch a movie without crunching on the warm white sugary kernels of heat-popped corn. By the time the trailers are done and the movie is about to begin, I am more than a quarter of the way into my box of popcorn. I need to slosh liquid in my mouth and floss as the closing credits roll and my hands finger the unpopped and burnt kernels scattered at the base of the box. Still, next movie, new box of popcorn. 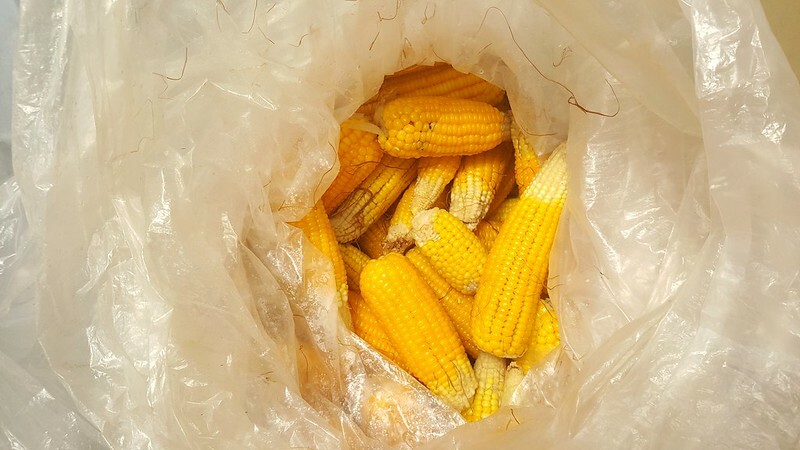 My second memory of corn is from much earlier in my childhood, of sitting in the backyard under a black sky with my extended family of aunts and uncles and friends and neighbours, waiting for the corn in the big aluminium pot to stop hissing and boil. I am listening with awe as they exchange stories of a life that I am too young to enjoy. When the corn is ready, they set mine on a plate on my laps, table knife and Anchor butter in tow. I remember, licking, sucking, biting, and chewing my corn, in no particular order, and wishing bedtime were far, far away. 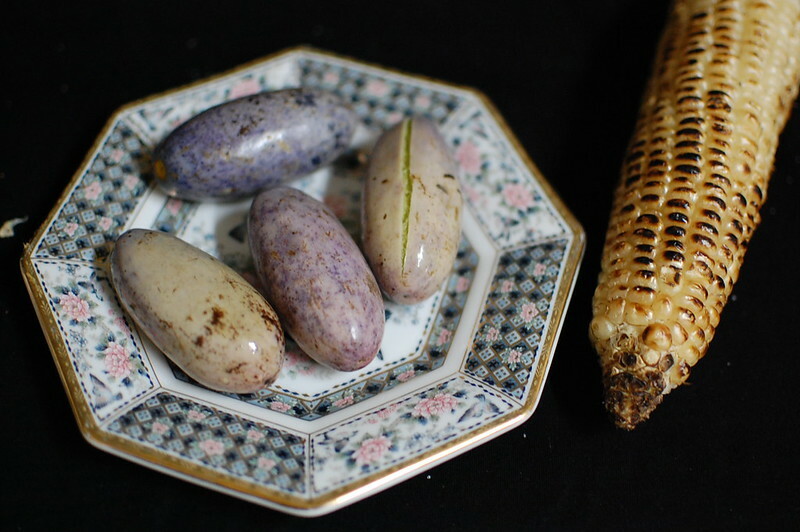 If I will eat corn this season, it will be like this – boiled. Freshly strained. Melting-butter hot. And trading stories in the company of the people I love.